A group of New Zealand councils have been trialling virtual games in city parks to encourage more children and families to get out and be active. The trial involved Magical Park, an augmented reality experience developed by GEO AR Games to encourage children aged 6-11 to get outdoors. The experience includes two smartphone or tablet-based games: Augmentia and Dino Land. 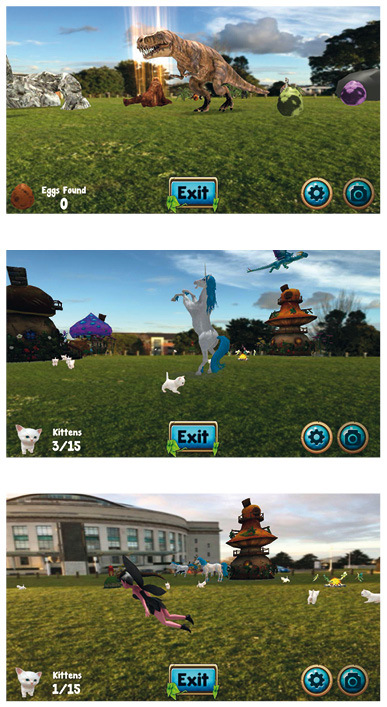 In Augmentia, children explore the park on their device while rounding up kittens, and in Dino Land, they must collect eggs while avoiding the fearsome Tyrannosaurus rex. The games were trialled for three months from June in a number of parks in Wellington, Auckland, Porirua and the Hutt Valley. “There’s certainly been interest and the games have generated more visits,” said Bruce Hodgins, divisional manager parks & gardens at Hutt City Council, which is trialling the app at Avalon Park. Bruce said Hutt City Council was keen to extend the three-month trial at Avalon Park to 12 months. Auckland Council senior advisor partnerships, parks sports and recreation Ken Maplesden said Magical Park had been similarly successful in Auckland, where it was trialled at eight parks. He said the trial had coincided with the rise of the global phenomenon of Pokemon Go, which has clearly demonstrated that people were prepared to go out and engage in location based play. “Augmented reality games have a great future, with a proven consumer appetite. Steering users away from urban structures and fast food outlet sponsorships and into parks will undoubtedly contribute to helping Aucklanders to be more active more often,” Ken said. Tim Park, environment partnership leader at Wellington City Council, said Magical Park had a positive effect in the capital city. During the July school holidays, there was a clear increase in the number of people frequenting the parks where the app was available. Professor Neil Dodgson, who heads the computer graphics programme at Victoria University in Wellington, said the potential for success was there, particularly if more councils become involved. The New Zealand Recreation Association (NZRA) says it is available to discuss implementation of the service with councils. “Technology has a big impact on recreation and this is an example of how it can encourage people to be more active,” NZRA chief executive Andrew Leslie said.